I love gadgets. I love technology. I love change. So I keep my ears to the ground and eyes open for new and exciting things. I am an early adopter. When LinkedIn came out, I jumped on board and have been told I am one of the first few million users. Admittedly, I am horrible at LinkedIn and only check in quarterly. But last week, I got an email. It was high tech. I was intrigued. I read it and became enthused. If you’ve ever sat at a cramped airport bar and waited more than a few minutes for a super expensive drink, you’ve probably fantasized about the idea of a robot whizzing around, whipping up cocktails, and cashing out patrons within seconds – without the pricey bar tab. I’m Alan Adojaan, CEO and Founder of Yanu – a fully autonomous robotic bartender that serves drinks, handles payments, and communicates with patrons. Yanu is the answer to high-trafficked airport bars where space is limited. Yanu is the perfect bartender – complete with a personality to match. Making up to 200 drinks per hour, my robot does away with labor taxation, slashes sick days, and lowers operating costs. Created to freely communicate with humans, Yanu is maintainable and relocatable – not to mention stunning to look at. 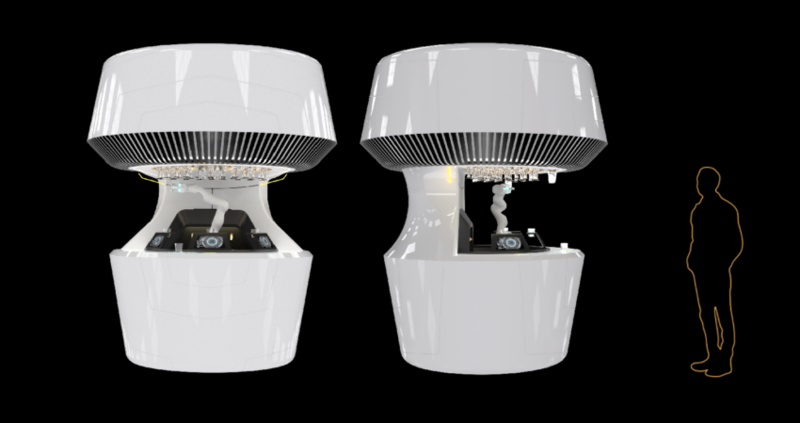 We’re launching an ICO in August to bring Yanu to the public, and already have contracts to put our robot in both the Amsterdam and Paris airports. Would you be interested in sharing about our cocktail-creating automated bartender with your audience at Travel Research Online? OK so at first it seemed gimmicky. And then I had second thoughts. How many airports had I been in looking to grab a cup of hot chocolate only to be dissuaded by the lines of “three pump, no caf, hyper mocha, latte lentil” Starbucks drinking crowd? How many times would a drink be just the ticket before boarding, but I relented because the bartender was more interested in speaking to the hot guy or girl at the end of the bar? Enter an AI (Artificial Intelligence) robot that can serve up to 200 drinks per hour. Huh? If my math is right this is 3 cocktails per minute! There is no bartender that can keep up with that pace. The robot handles the payment, the order, the creation, and delivery. It doesn’t get any more convenient than that! From a business perspective it is ideal. At $25K a pop (unsure what maintenance costs are) it is affordable for most. For the business owner, over-pours are eliminated, mis-counted change is gone, and I suspect the need to tip is also gone–not sure where robots will spend their 20%. I see hundreds of hipster bars looking for something to differentiate themselves from the others. I see plenty of airports trying to move more people through their already strained infrastructures. I see tourism hubs and cruise ships looking to implement these as well. I could be all washed up and this could be a flash in the pan, but I do think it has some legs. And so does Yanu. They will be installing the robots at ORD and AMS in the next month. Anyone up for a road trip to get a drink?